The concert highlights the creative work of our guest artists in residence as well as our own faculty. This semester, our students will perform the work of Rick Southerland, a long-time faculty member in the Dance Program. His piece, Pas de Scope, is inspired by the textures and forms created by kaleidoscopes. 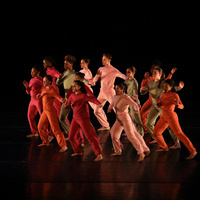 Additionally, Tamara Thomas, who joined the Goucher dance faculty this fall, will be presenting her choreographic work. Ms. Thomas comes to us from the University of Georgia and has a highly acclaimed background as an educator, performing artist, and choreographer. The program also features works by Karole Armitage and Shani Collins-Achille. Megumi Eda, founding member of Armitage Gone! Dance and former dancer with Hamburg Ballet and Dutch National Ballet , set company repertory on our dancers. Ms. Collins-Achille is the artistic director of Eternal Works Inc. and performed with Ronald K. Brown/Evidence, and Urban Bush Women. Learn about the evening’s choreography from some of the artists themselves on Friday at 6:45 p.m. This portion of the event will be in Merrick Hall, next to Kraushaar Auditorium. $15 general admission; $5 students with ID, senior citizens, and anyone with a valid Goucher OneCard.